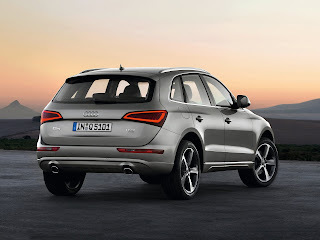 The Audi Q5 (Typ 8R) is a compact executive/entry-level luxury crossover manufactured and marketed by Audi since 2008, using the Audi MLP platform (Modular Longitudinal Platform) which debuted on the 2007 Audi A5 coupé. 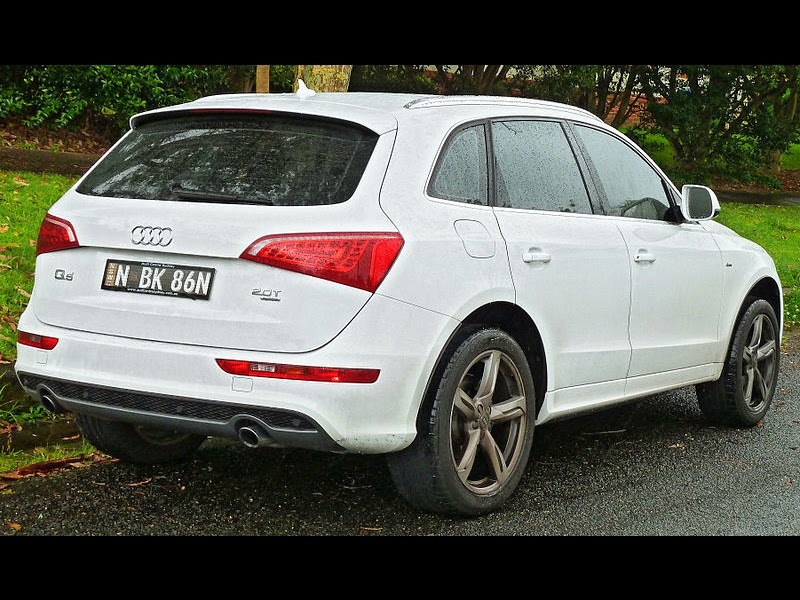 The Q5 is smaller than the Audi Q7 and larger than the Audi Q3. A concept vehicle for the then upcoming Q5, this was a 2-door convertible with 3.0 TDI engine rated 240 PS (177 kW; 237 hp) and 500 Nm (369 lbft) torque, quattro permanent four-wheel-drive, 8-speed automatic transmission, Copper Sunset body, LED headlights, 21-inch wheels with 265/35R21 tyres, seats with White Stone leather upholstery, MMI, 505W Bang & Olufsen sound system and internet radio, CDC (continuous damping control) shock absorbers, electric ride height adjustment (40 mm), 380/356 mm front/rear ceramic brake discs with 6-piston monobloc aluminium front, and floating rear callipers, Audi drive select. The vehicle was unveiled in 2007 Los Angeles Auto Show. The vehicle was unveiled in 2008 Beijing Auto Show, and later in 2008 LA Auto show. Early models include 2.0 TFSI quattro (211PS), 2.0 TDI quattro (170PS), 3.0 TDI quattro. Initial vehicle models for US, Canada & Brazil include 3.2 FSI. The Q5 commenced shipments in October 2008 for Europe, and the first quarter of 2009 in North America. US model went on sale in March 2009 as 2009 model year vehicle. Early models include 3.2 FSI quattro. 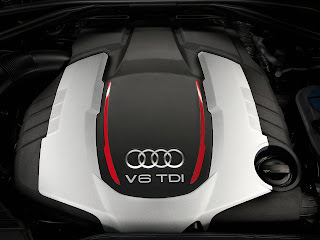 2.0 TFSI quattro (211PS) was added in 2011 model year. Indian models went on sale in June 2009, and were initially built from Audi's Ingolstadt facility, but now its built from its Aurangabad, Maharashtra, India plant. Launch models include 3.0 TDI, 2.0 TFSI (211 PS). 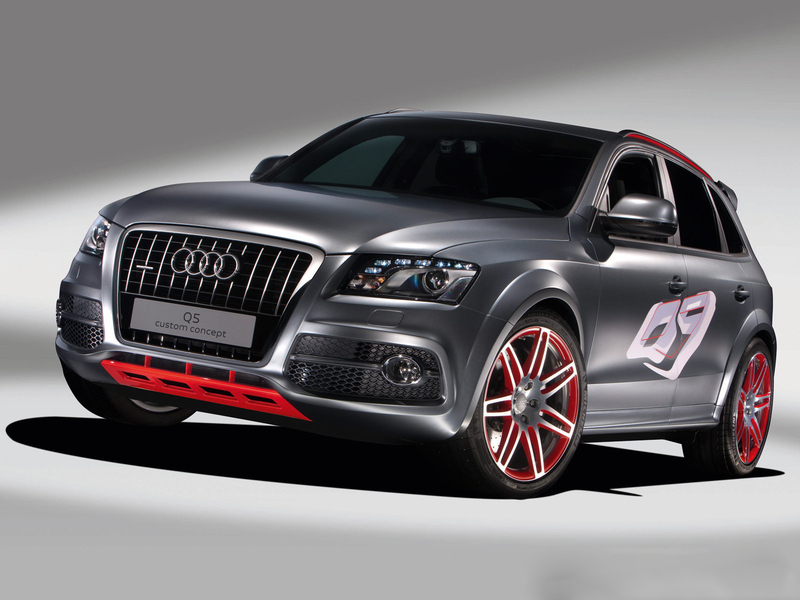 It is a concept vehicle that includes an enhanced engine, 7-speed S tronic transmission, quattro all-wheel drive. The 3.0 TFSI V6 engine was rated 408 PS (300 kW; 402 hp) at 6000–7000 rpm and 500 Nm (369 lbft) at 3000–5500 rpm. Other features include ceramic brakes, active sound exhaust system, 90 millimetre wider track, 60 millimetre lower ride height, 21-inch Daytona Gray colour wheels of 7 twin-spoke design, modified air intake, cooling water strut brace in engine compartment, stainless steel-plated pedals, S line sport seats, panorama roof system, "Wörthersee 09" adhesive film, textile floor mats with "Wörthersee 09" print application, Audi drive select vehicle dynamics system, parking aid with rearview camera, voice control, Audi lane assist lane change assistant, headlight range control with cornering lights. The vehicle was unveiled in Wörthersee Tour 2009. 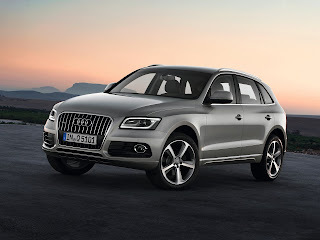 Audi was originally reported that it would offer Q5 hybrid as launch model, but it was later reported that Audi suspended the plan because of unsatisfying crash test result for the nickel metal hydride batteries. In 2009, Audi announced it would resume the Q5 hybrid development. It included a 266V, 1.3 kWh, battery pack. 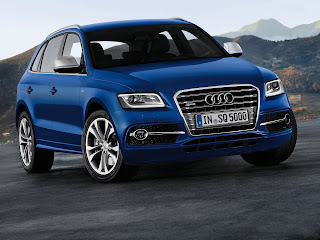 The Q5 has an all-electric range of about 3 km (2 mi) and maximum all-electric speed of 100 km/h (62 mph). The production version would be on sale in 2012 for Japanese market. The release in the U.S. market is scheduled for late 2011. 54 PS (40 kW; 53 hp) @?, 210 Nm (154.89 lbft) @? 245 PS (180 kW; 242 hp) @?, 480 Nm (354.03 lbft)@? Harman/Becker Automotive Systems produced Audi's new updated Multi Media Interface (MMI) technology for Q5. The new system includes navigation, communication, and wide-screen entertainment. A three-dimensional orientation view with true-to-scale terrain and photorealistic depictions of key landmarks will also be generated. Included features in this new system are USB storage media (iPod or MP3), satellite radio, and an integral four-band GSM mobile/cell phone (SIM card ready) with Bluetooth connectivity. S line package includes 20-inch S line wheels, headlight washers, sport steering wheels with shift paddles, brushed aluminium inlays, S line aluminium door sills, and a black headliner. The Offroad exterior package includes front and rear underbody protection panels, along with flared fender and door sill protection. The Audi Q5 is capable of towing up to 2.0 tonnes; the standard hill descent control system makes it safe to navigate down steep inclines by regulating the preselected speed when driving at under 30 km/h (19 mph). The Q5 is also fitted with an advanced Trailer Stability Program designed to combat any unwanted snaking when towing a large trailer or caravan. The new vehicle was expected to be built in Audi's home town of Ingolstadt. It was expected need an investment of €300 million in production tooling and expansion. Main changes include a redesigned set of front and rear light configuration, and a new set of engines that increase both output and efficiency. Most interior user controls have narrow chrome trim. Ergonomics changes include 4-button MMI navigation plus system, additional skip function for volume dial. Large fabric-upholstered surfaces are standard on the door trim panels; inlay options include three wood veneers and one aluminium version. The SQ5 performance SUV is the first Audi S model vehicle to feature a diesel engine. The primary power plant is a 3.0 litre (2967 cc), twin-turbo V6 engine coupled to an 8-speed Tiptronic transmission, developing 313 PS at 3900–4500 rpm, and 650 Nm of torque at 1450–2800 rpm. It also features Audi's signature quattro permanent all-wheel drive system with torque vectoring transfer. Sport suspension lowers the vehicle body by 30 mm (1.18 in) and 20-inch 5 parallel-spoke wheels with 255/45 tires are fitted as standard, with the option of upgrading to 21-inch wheels. 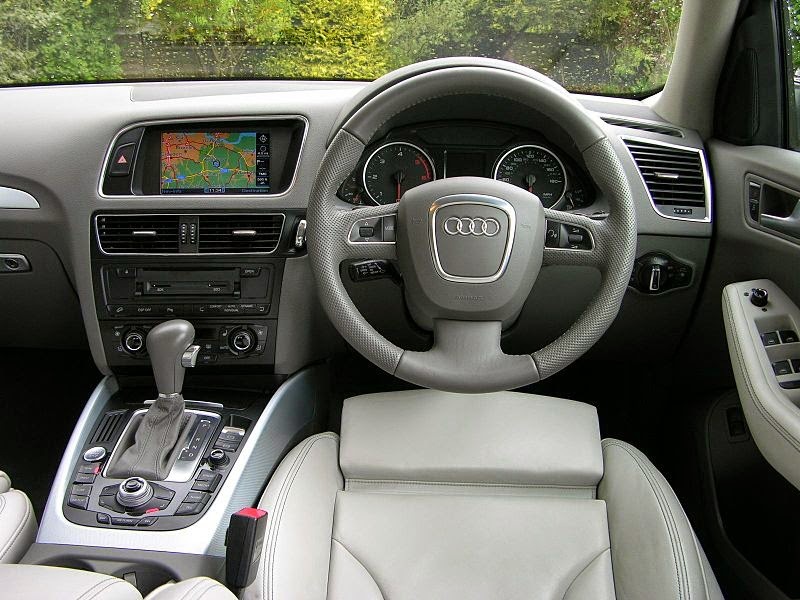 Other features of the SQ5 are black front brake callipers with Audi 'S' badges, an optional Audi drive select system, a platinum-grey single-frame grille with galvanized double bars, two SQ5 unique body colours (Estoril Blue or Panther Black), optional lunar silver headlining, Pearl Nappa leather/Alcantara power-adjustable sport seats with optional leather upholstery in a choice of four colours, brushed aluminium inlays with optional Carbon Atlas, Piano finish or Aluminium/Beaufort wood trim panels. 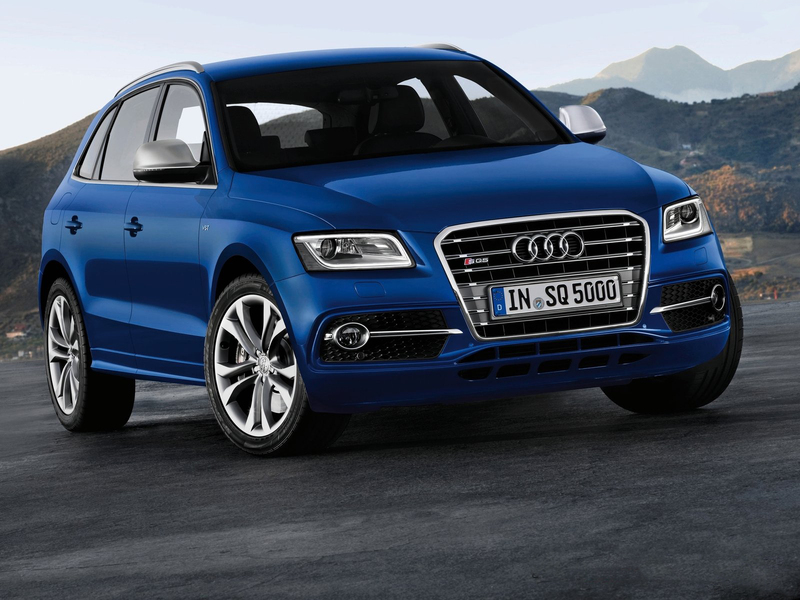 The SQ5 TDI accelerates from 0–62 mph in 5.1 secs, and is electronically limited to 155 mph. This is comparable to rival range-topping performance SUVs with diesel engines, such as the Porsche Cayenne S Diesel (0–60 mph: 5.7 s) and BMW X5 M50d (0–60 mph: 5.4 s), and also to high-performance petrol-powered SUVs, such as the Mercedes-Benz ML63 AMG (0–60 mph: 4.8 s), Porsche Cayenne Turbo S (0–60 mph: 4.7 s). It should be noted that these listed rivals are all larger and heavier, falling into the mid-size SUV class, and, as such, command significantly higher asking prices. A more realistic comparison may be made with the BMW X3 xDrive35d, which delivers slightly better economy (46.3 mpg to the SQ5's 41.5), though slightly lower performance (0–62 mph: 5.8 s, max speed: 149 mph). The vehicle was unveiled in 2012 Paris Motor Show, and went on sale in the first quarter of 2013. 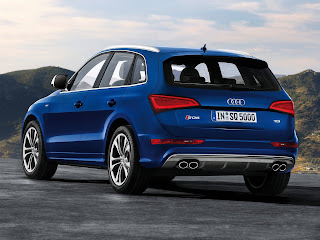 It is a petrol version of SQ5 with 3.0 TFSI engine rated 354 PS (260 kW; 349 hp)@6000–6500 rpm and 470 Nm (346.65 lbft)@4000–4500 rpm, eight-speed tiptronic transmission, quattro permanent all-wheel drive with torque vectoring, 20-inch wheels with 255/45-series tires (optional 21-inch wheels), platinum grey radiator grille with horizontal double bars in aluminium look, choice of 2 crystal-effect body colours (Estoril Blue, Panther Black), instruments feature grey dials and white numerals, pedals and shift paddles in shiny aluminium-look finish, black interior with headlining optionally available in Moon Silver, power-adjustable sport seats upholstered in Pearl Nappa leather and Alcantara (option four different colours of leather), standard brushed aluminium inlays (optional Carbon Atlas, Piano finish or layered aluminium and wood in Beaufort black). The vehicle was unveiled in 2013 Detroit Auto Show. 54 PS (40 kW; 53 hp) @?, 210 Nm (154.89 lbft)@? 245 PS (180 kW; 242 hp) @?, 480 Nm (354.03 lbft) @?